1 Reclaiming space Today was a productive day! My chap emptied an ensuite bathroom that had been previously used as storage for so much STUFF it was practically up the ceiling & you couldn’t open the door properly. Well, it’s all gone! Bags and bags chucked & more to sort & sell/charity. The room is now empty! He ripped out a nasty dusty manky carpet & we are planning on revamping the whole room to make a “grown-up” bathroom! Just need to sell some stuff to get some spare pennies. Wish we’d taken a before photo when it was rammed full like something from an episode of hoarders! 2) Multitasking mama – managed to list quite a bit on ebay today whilst feeding & cuddling Sylvie AND we have bids already! Promising start & more dosh hopefully towards laptop/bathroom fund. 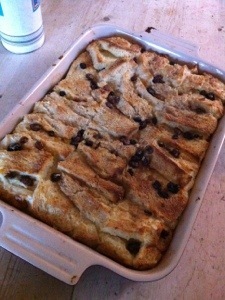 3 Bread & Butter pudding Had a wonderful roast dinner made by the man, then to follow a big comfort stodgy pudding that I’d never tried, let alone made before. Was made with two day old tiger bread & a recipe from a book called “Just like my mum used to make”. Not the best photo but was rushing! 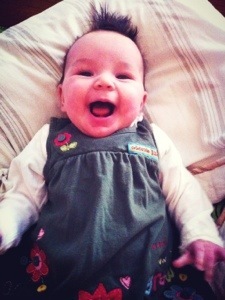 4 Smiles a recurring theme but this little lady can never fail to cheer us up!